I spent a Spring week in Friuli Venezia-Giulia, the northeastern region of Italy where days on the green, fertile plains were warm and sunny, and nights retained the chill of the Alps. It was perfect grappa weather: a small taste of fiery aromatic fruit at the end of dinner to keep you toasty-warm inside while walking home through the brisk evening air. Grappa is the Italian version of the distilled spirit made from the leavings of the grapes after winemaking. (The French name for this is marc.) The raw materials are distilled, and sometimes fruit or other aromatic essences are added. While this doesn’t sound very attractive, in recent decades fine grappas have become quite smooth, as well as more flavourful. Recently, Italian producers such as Nardino and Nonino have refined, promoted and exported their grappas, often in beautiful, hand-blown bottles. (French marc producers have yet to begin competing in this area.) These grappas still have the heat, the kick and the high alcohol content, but are notably easier to sip after a meal than the marcs I first sampled out in the Burgundian countryside some dozen years ago. Grappa originated in the northern provinces of Friuli Venezia-Giulia, Piedmont, Trentino-Alto Adige and the Veneto. European Union regulations require that the spirit called grappa be made only in Italy. An association of producers founded the Istituto Nazioniale Grappa in 1996 for self-regulation. In geographic denominated areas, the alcohol must be at least 40%; in other areas the alcohol can be 37.5% of volume. The distillation process and the grapes used are further regulated. A hundred years ago there were nearly 200,000 distillers. This dwindled to next to nothing, and today the number (currently about 130) is increasing. In addition, there are over 500 “producers”, a category which includes bottlers and packagers. Current production is equivalent to 40 million 70cl bottles, though many bottles are packaged in smaller sizes. Production is also increasing for “farm grappa”, where the spirit is distilled by contract for growers and sold along with their wines. Grappa is made by distilling the leavings after pressing grapes for wine. This is done either in continuous or single batch distillation. 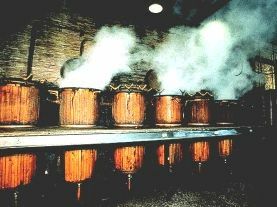 The oldest stills are direct-fired and double boiler stills, but steam heating is most common nowadays. 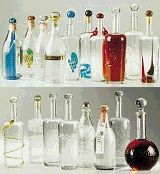 Grappa development and regulation is ongoing, but virtually all of it is made with a single, slow-distillation process. The resulting liquor is clear, and remains clear as grappa is not aged in wooden casks like Cognac or Brandy. Due to the exacting nature of this type of refining, in grappa production the “stillman” is equivalent to the winemaker. He or she has responsibility for overall production, taste and quality of the product. Traditionally, grappa was made from whatever grapes were available, usually a multi-blend of varieties. Today, grape selection is also part of the process. The pioneering firm of Nonino invented cru monovitigno or single-variety grappa in the 1980s. Grappa classifications and designations now follow wine classifications when made from grapes in denominated areas. Most recently, high-end wine producers such as Antinori and Banfi have also begun grappa production. Today, grappa represents both the past and the present. Distilling the “grape leavings” is a tradition hundreds of years old. Though the flavours, aromas and textures of the liquids are much finer today, many high-end producers retain the visual and tactile sense of the Renaissance or Early Modern era, with bottles and stoppers incorporating a variety of seals, ribbons or laces, caps of gold, and bright decorations of blown and coloured glass. The Istituto Nazioniale recommends serving grappa in a small, clear, tulip-shaped glass – like a miniature wine glass or Champagne flute. It should be served at a cool temperature of around 9 to 13C for young grappas; older grappas can be served just below room temperature (17C), or can be warmed with the hands if the liquid is too cool. The combination of glass, fire and comfort appears as a reccurring theme in the world of grappa. With fine wine producers entering the market, and interesting products such as Nonino’s breakthrough honey distillation just appearing, there will be many reasons to continue sampling new grappas. At Nonino, there is a beautiful glass-enclosed tasting room looking out onto greenery, with a welcoming fireplace, carpets, comfortable upholstered seating and a large dining table at one side of the room for more structured tasting. Grappa club, anyone?